Greetings, and welcome to Syrnia! This guide will give you a brief explanation of our world and how it works. If you would like a more in-depth breakdown of everything Syrnia has to offer, be sure to check out the Advanced Beginner's Manual. If you would like to learn the specific details of each skill, click on any of the skill images located directly above this section. After your first log-in, you will be guided through Tutorial Island, which will help you learn the basics of each skill. When you've completed Tutorial Island and have arrived in the quiet town of Sanfew, you can use this manual to help you decide your path! Above is a screenshot of the game's main screen. This image will be referred to a fair amount in the manual, so be sure to check back if you are confused. 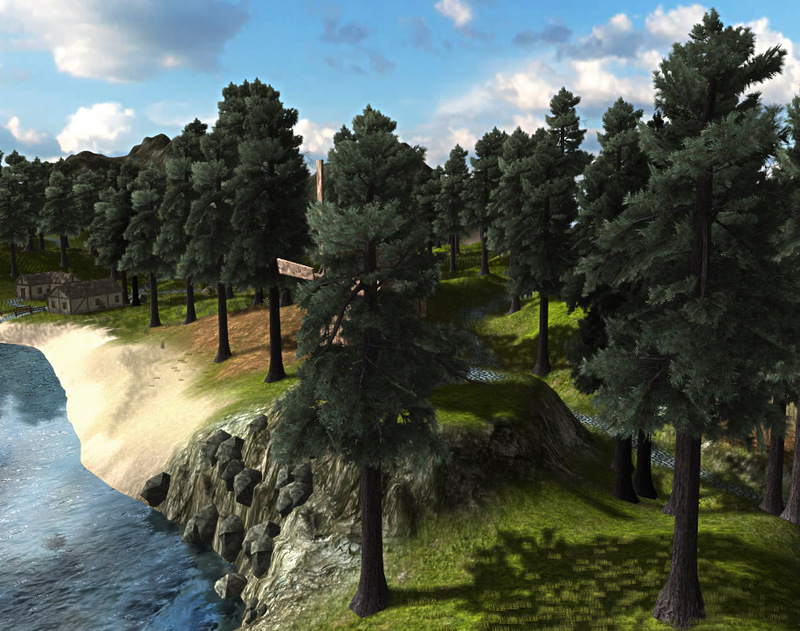 You will begin your Syrnian adventure in Sanfew, which is the first town on Remer Island (Pictured above.) In order to move between towns, you must click on the name of an adjacent town on the map. A timer will appear, and you will begin walking to the selected town. Equipping a horse speeds up your travel, but when walking between towns without a horse equipped, you will gain Speed experience, and you might even find a rare flower here and there. From Sanfew, you can either walk to Lisim or Rynir Mines, where you can go fishing, or mine for ore respectively. Each town on Remer has at least one specific skill that can be trained, and each island offers new and exciting things to explore. 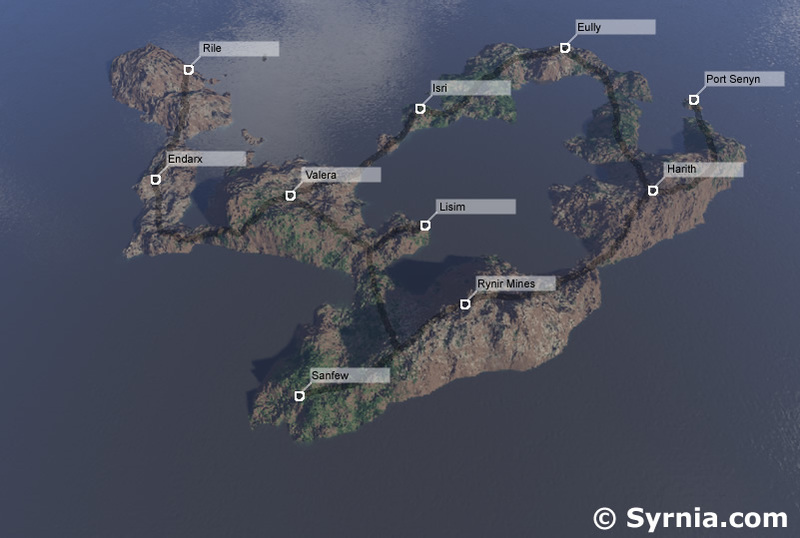 Syrnia currently boasts twelve unique islands. For the majority of the islands, you can travel between them from each island's port town. (Port Senyn being the port for Remer Island.) From the port, you can either pay a small fee to be ferried to the next island, or you can build a boat with Wood using the Construction skill and sail there yourself for free. Access to a few high-level islands require you to either cross the dangerous PvP-enabled Outlands, or use teleportation orbs created through the Magic skill. Collect Wood that can be used to build or cook. One of the most important first steps in Syrnia is to build a house to store your gold and items. Thieves can steal gold you are currently holding, and you can lose the items in your inventory if you die while in Combat. Equip your Bronze Hatchet by clicking on it in your inventory. Click on, 'Woodcut' in the Town Menu. You are now chopping Wood (Displayed in the main window). Every time the timer reaches zero, you will gain one Wood, which will be will be added to your inventory. The amount of wood you currently hold is displayed in the main window. Skills have secondary drops that you can gain along with the main resource. While you are Woodcutting, you can find seeds, which can be used with the Farming skill. Collect ore that can be used to smelt metal bars. Once you arrive, equip your Bronze Pickaxe by clicking on it in your inventory. Click on, 'Mine Copper Ore' at the City Menu. You are now mining Copper Ore.
Next, click on, 'Mine Tin Ore' at the City Menu. You are now mining Tin Ore.
As a secondary drop, you will occasionally find gems while mining, which can be used with the Magic skill. Smelt ores into metal bars, and smith those metal bars into tools, weapons, and armour. Click, 'Smelt Bronze Bars'. Bronze is an alloy of copper and tin, so it takes one Copper Ore and one Tin Ore to create a Bronze Bar. Once you have your Bronze Bar(s), equip your Bronze Hammer. Click, 'Smith' at the City Menu. You can now see all items that are available for you to smith at your level, and what resources are required for each item. Catch fish to be cooked and eaten. Once you arrive, equip your Net. Click on 'Fish' at the City Menu. You are now Fishing for Raw Shrimp. Once you reach a high-enough level, you can also fish with a Fishing Rod. Cook Raw Fish to eat while in Combat and restore Hit Points. Click on ,'Cook Shrimp'. You will begin cooking your Raw Shrimp. The process burns Wood from your inventory. There is a chance to burn fish as you cook them, but the burn rate will drop for fish lower than your current Cooking level as you grow in the skill. These are just very basics steps in a few skills, there are far more skills in the game, to learn more about Syrnia please read the 'Advanced beginners manual' where you can find detailed information on the cities of Remer Island. When you have read that manual and need more information on a specific skill, click on a skill picture at the top of the manual to get a detailed description of each skill.